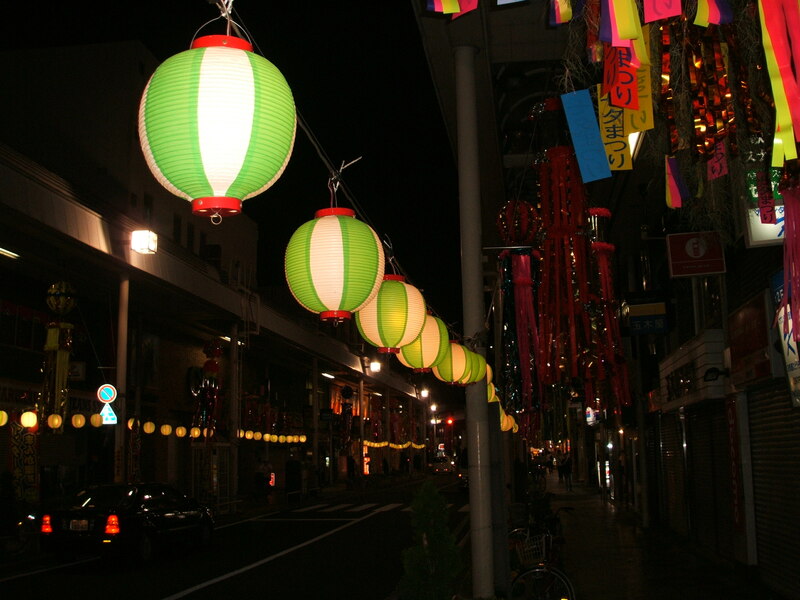 Next week is 七夕 (Tanabata). Click here to read my short FAQ post about “Tanabata”. The shopping street near our house has begun to decorate for it a couple days ago. They put up bamboo trees, paper lanterns, and other decorations. The local school children will write their wishes on a piece of paper to be tied to the trees. We’ll put a bamboo tree on our porch next week, as we do every year…and my kids, my wife and I will attach papers with our wishes written on them. My wife and I always write the same thing: that our kids will have a happy, healthy life. Yesterday at lunchtime, a comedian who is starting to become popular was scheduled to perform at a store not too far from where we live. We planned to go watch him…but we all woke up too late to get there on time, so we went to our kids’ favorite shopping mall instead. But it started me thinking of famous people that I’ve met on the streets of Tokyo. and 琴欧洲 Kotooshu (the Bulgarian Sumo wrestler). We have a pet turtle. His name is 亀吉くん (Kamekichi). Thanks for visiting my site again (and commenting)…feel free to comment anytime! do you have facebook address? My oldest daughter is almost sixteen. I don’t mean to nit-pick, ‘cuz I know what you mean. Yes, I was born in America. But the phrase “native American” is usually used as another term for “American Indians“…so, in that sense, I’m not a “native American“. >do you have facebook address? No. I don’t see the appeal of “networking” sites such as Facebook or MySpace. You’re only 16? Just a year older than my oldest daughter! Anyway…thanks for visiting my blog and commenting! Sorry…I don’t know Ototake-san’s email address. But you’re right…he is very admirable. I was lucky to have met him briefly in Yokohama! It’s a funny turtle. If you’re the turtle lover, you can come to my house in Indonesia, cause here’s a lot of turtle, and noone wanna protect them. So, please send me his email and say my “admiration” for him if you meet him again. I wanna talk and meet Oto also. He’s great man! We got the turtle about two months ago. He didn’t eat at all for three weeks after we brought him home…we were worried. But he eats plenty now! Your pet turtle is cute! When did you get him? I’ve never run into any famous people. But as you know, I worked for one! I also saw Cher’s house when I went to Malibu (part of the job when I worked for this person).